We spoke with Josh Wilbur, brainchild behind the “Steeped Coffee” concept just out of beautiful Santa Cruz California. Just when I think I have run out of things to talk about, something interesting comes down the pipe. And that is Steeped Coffee. 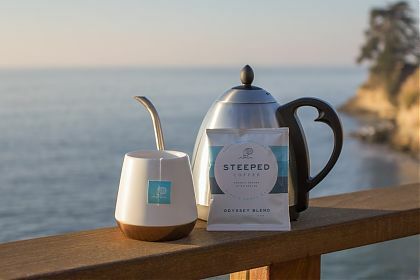 Steeped Coffee has just launched, arguably, the easiest way to make a great cup of coffee with their fully compostable single-serve bags. Steeped Bags replace the need for wasteful pods, expensive machines, and time-consuming homebrewing equipment. And for the first time, this new brewing method combines the quality and ethics of specialty coffee with the convenience of a single serving. Not only that but the packaging is Earth friendly too! Wait, what? My lab mates and I tried some free samples of the Steeped coffee product recently – simply following the dead simple instructions – Hey, if you can make a cup of tea you can make a darn fine cup of coffee. As the press info goes: “Each portion is delivered in a fully compostable nitro sealed packet for freshness, essentially halting the coffee’s aging process so it’s like it was ground within moments.” And we found this to be true. Just ground freshness in an envelope. Whoa. We love it when a plan comes together. In our lab at the University of Victoria, we enjoy great coffee every day. We grind and brew for Hario V60 brews as well as Newco pro drip brewers. In a pinch it would be nice to have a slightly faster process that we can count on in a pinch – and have a clear conscience too! We have reviewed numerous “instant brew” type machines with PODS and such that are a blight on the environment. Steeped Coffee has thought it through and brought us something that we can live with. And a product that tastes good. Stay tuned! For more information, visit Steeped Coffee online. I love my brother in law Josh wilbur you are so awesome and amazing I’m proud of you dude and happy for you and my sister and fin and the new one on the way I’m so excited to see amazing things happen for u and ur company I’m so proud love you guys!!! Indeed! A great product and worthy of some serious attention!